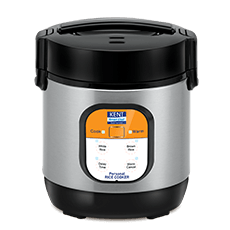 This kent personal rice cooker comes with an advanced induction heating function that ensures you get evenly cooked rice every time.The rice cooker comes with a delayed cooking function that lets you cook food at your desired time. The personal rice cooker has a compact and perfect design which makes it convenient for bachelors and travellers to prepare tasty, healthy and hygienic rice and biryani. To Recieve updates and possible rewards for Kent 16019 please sign in. To Recieve updates and possible rewards for Electric Rice Cooker please sign in.